Moody’s rating agency downgraded Japan to A1 from Aa3 on December 1st. The non-reaction by the JGB market was a cause for some amusement; once again stern warnings by ratings agency analysts are essentially being laughed at. This is not complacency on the part of bond market participants, rather it reflects the fact that the rating agencies have no sensible methodology to deal with currency sovereigns. 3. In consequence, increased risk of rising JGB yields and reduced debt affordability over the medium term. However, the strategy also poses risks to fiscal consolidation and, over the longer-term, to debt affordability and sustainability. Japan's deficits and debt remain very high, and fiscal consolidation will become increasingly difficult to achieve as time passes given rising government spending, particularly for social programs associated with a rapidly ageing population. Moody’s logic revolved around the concept of sustainability. Unfortunately, there is no sensible way of defining “sustainability” for a country that controls the currency that it borrow in. Projecting debt levels based on ad hoc assumptions about the primary balance is not a macro model; it does not take into account the relationships between the government and non-government sectors. There is a lot of discussion about the government possibly falling short of fiscal targets. There is no explanation why missing targets in the future will matter when previous misses have had exactly zero observable impact. It should be noted that some governments – those that borrow in foreign currencies, or sub-sovereigns (state, provincial or municipal governments) – routinely default. For these governments, rating agency methodologies may work on a statistical basis. a repudiation of the debt (“unwillingness to pay”). The methodologies used by rating agencies focus on government fiscal ratios, and tell us nothing about geopolitics. Therefore, even though scenario #1 has been historically been a major source of defaults, rating agencies tell us little about the possibility. A failure in funding operations (scenario #2) is possible due to governmental incompetence, but that seems quite unlikely. There would be so much pressure to find a solution by all involved parties (including bond holders) that the operational rules would be bent to allow funding to be rolled over. Instead, the real risk is #3, although a debt repudiation could be disguised as an operational issue (as seen in the ‘Debt Ceiling’ fights). I deliberately rule out ‘market revolts’, in which market participants refuse to bid at debt auctions and force a default. The power of so-called ‘bond vigilantes’ is provisional, as a determined central bank can always ram short-maturity paper down the throat of a banking system. (“That’s a nice banking license you have there, it would be a shame if anything happened to it.”) If such a revolt appears to have occurred, I would lump it in with scenario #2; it is just incompetence by the funding agency and/or the central bank. So the question is: why would the government choose to repudiate its debt? interest costs are “too large”. A high debt-to-GDP ratio by itself is meaningless, as many JGB bears have discovered the hard way over the past couple of decades. Government debt is continuously rolled over in large amounts, and so there is no particular “funding risk” associated with increased debt ratios. Inflation is ultimately the true risk of too loose fiscal policy. However, there is nothing to connect the Japanese fiscal ratios to the inflation rate. We have certainly seen no effect so far, and there is no sign of a structural change in the economy. In any event, high inflation will raise nominal GDP, and drop the debt-to-GDP ratio that everyone is worried about. This just leaves us with “too high interest” as a mechanism. 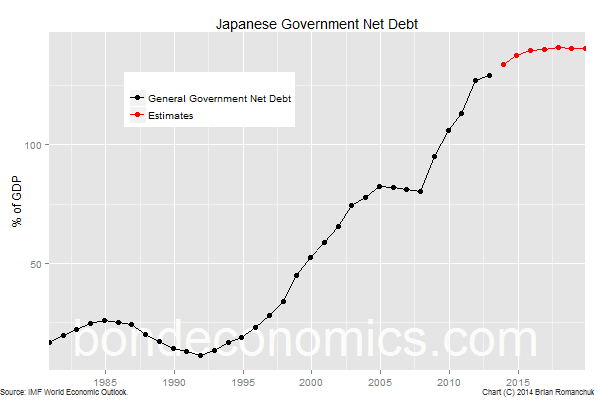 Although everyone enjoys looking at Japan’s gross debt (“1 quadrillion yen in debt outstanding!”), the net debt-to-GDP ratio is the one that matters for interest costs. The Japanese government has a particularly bloated balance sheet, including hefty foreign exchange reserves (USD $1.27 trillion at the end of October, according to the Ministry of Finance). Unless the economy falls into a deep recession (it appears to be in a shallow one now), the net debt ratio is likely to remain close to current levels, following the trajectory in the IMF World Economic Outlook (shown above). When looking at private issuers, gross debt matters, as they face considerable rollover risk – unlike central governments. The Ministry of Finance is budgeting 10.1 trillion yen for interest costs for fiscal year 2014, which represents about a 1% interest rate on the gross debt. Since the net debt-to-GDP ratio is around 140% of GDP, the net interest cost faced by the government should be well under 2% of GDP. Despite the weird debt service metrics that are discussed on the internet, Japanese interest costs are fairly trivial, and are unlikely to change much on a horizon of a few years. The average maturity of Japanese debt is around seven and a half years, and so the current interest rate structure is largely locked in. Therefore, it will take considerable time for the average interest rate paid to rise after short rates start to move up from 0%. And since those short rates are under the control of the Bank of Japan, they are only likely to rise if nominal GDP growth is firmly positive, either as the result of real GDP growth or inflation. Since nominal GDP growth would be higher than the interest cost, debt-to-GDP ratios would start to fall, even if the government remains in deficit. Moody’s warned about the possibility of higher inflation driving up bond yields without growth improving. This is not a big worry. Of course, the JGB market can sell off at any time. But given that the funding rates at the front of the curve (5-year maturity and under) are pinned down by the Bank of Japan, and the duration of debt outstanding is long, the average interest cost would not measurably change. And it is difficult for bond yields to remain elevated for more than a few months unless higher yields are ratified by central bank rate hikes (as Treasury bears re-discovered this year). Since there are no “sustainability” issues on shorter horizons, what about the “long term”? It is clear that there are long-term risks to JGBs, but standard sustainability analysis tells us nothing about them. We need to look at what the holders of JGBs are doing, not the issuer’s finances. If the owners of JGBs start to spend out of their holdings, the added demand would create inflationary pressures in the economy. This would eventually force rate hikes by the Bank of Japan, and raise the interest burden. Although it is fun to think about potential long-term scare stories, the reality is that inflation would have to go up in order to start the new trend. And there is no sign that the little inflation Japan has experienced has any momentum behind it. If high debt levels helped push inflation, we would have seen it by now. If you are worried about Japanese inflation, you have to look somewhere else. As a result, the fiscal ratio-centric analysis used by the rating agencies is not telling us anything about inflation risks. Hence, they are ignored by the market. They would need a credible model that gives accurate long-term forecasts of non-government behaviour. Given the state of macro modelling, that appears to be wishful thinking. I am not addressing the concerns about Japan's "rapidly ageing" population. Unless the Japanese are in some weird time warp, they are ageing one year at time, the same as everybody else. Demographic shifts are slow-moving, even in Japan, and it makes no sense to change policy now based on a guess what the situation will be like in five years. The automatic stabilisers of the welfare state react far faster than demographics can change. Policymakers will have plenty of time to note changes in the macro environment, and adjust settings as it proves necessary. (Update) This article in Italian (translated by Luca Pezzotta). Excellent post, especially the sections on 'what is sustainability' and 'mechanisms for repudiation'! It's absolutely mind-boggling that so little is understood about the implications of currency sovereignty. The focus on the "inter-temporal governmental budget constraint" has not helped matters either. "If the owners of JGBs start to spend out of their holdings,"
Other holders would take their place, assuming its not the BOJ thats buying their securities. If the savings desires dropped precipitously in Japan, aggregate demand would increase, increasing tax collections and reducing the deficit. "the added demand would create inflationary pressures in the economy." "This would eventually force rate hikes by the Bank of Japan, and raise the interest burden." At what level of debt to GDP do you think interest rate hikes are inflationary due to the interest spending increases? When you have a debt-to-GDP ratio of 100%, it seems that interest rate hikes should be inflationary as a 1% hike is adding 1% of GDP to the interest bill. When compared to "normal" fiscal deficits, that's a big increment. That should be more important than whatever contraction a 1% rate increase has (which is not a lot; most tightening cycles have to go a lot further than that). At lower levels of debt-to-GDP ratios, the effect seems like it would be less important. For example, if you are at a 25% ratio, you need to hike rates by 4% to get that 1% of GDP interest income increase. It seems that the depressive effect of 4% higher interest rates would be more important. For levels in between, it seems like it would be a mix between those two cases. Most countries are now in that range. What probably matters is how sensitive the private sector is to interest rates. A present, Canada has an inflated housing bubble, and rate hikes could easily be quite deflationary. In the United States, however, my feeling is that with the housing market knocked back to reality, the rising interest income effect could be more important. Making the so-called "burden" of debt less"
Yes. That leads to another point that I probably should have worked into the article. If you are bearish on sovereign bonds, you actually hope the debt-to-GDP ratio falls. That is what happens when nominal GDP is growing faster, which typically pushes up nominal interest rates (based on normal central bank reaction functions). But a hike in the interest rate (the Fed Funds rate) won't immediately affect all of the outstanding Treasury bonds. Longer term bonds will continue paying the coupon interest rates from when they were issued. I'm not sure what the average duration of Treasuries is. Yes, there would be a lag. I do not have the average maturity, but I think it is around 7 years. The TBAC documents may have the figure. I used to calculate it from the bond-level information from the Treasury. Nice article & responses. Of course, the inflationary impact of interest rate increases also has everything to do with the propensity to spend of those receiving the interest income. Given they tend to be investors, it may be very low. U.S. Treasury debt is actually very front-loaded. While the average maturity is just under 6 years, the median maturity is only 3 years, with about 25% coming due within one year. If you net out Fed holdings, the average maturity is less than 5 years. Thats a really good response to the interest rate impact determined by debt to GDP level point. The process is so complicated and dynamic, its absolutely amazing to me that it is taken as gospel widely throughout mainstream economics that the correct response to higher inflation is always raising interest rates. But I guess nothing in economics should surprise me any more. It's remarkable how difficult people find it to get their head around the idea that changes in debt-income ratios depend on the relationship of average interest rates to nominal income growth , and not just on new borrowing.